September 20, 2011/Review October 19, 2011 — Dave Bidini, an accomplished writer and a founding member of the Canadian band, the Rheostatics, has written a unique book, which is part musical history, and part Gordon Lightfoot biography. 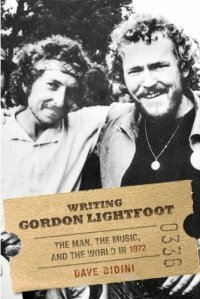 The title, "Writing Gordon Lightfoot: The Man, the Music, and the World in 1972" (Amazon.com (hardcover) link), (Amazon.com (paperback) link), (Amazon.com (Kindle) link), (Amazon.ca link) or (Amazon.co.uk link), is a literal description of how the subject is treated; that is, Lightfoot's life is portrayed in the form of a series of letters from Bidini, addressed to Lightfoot. It is certainly a novel way of telling the story of Lightfoot, and also the story of 1972 Mariposa, at which Bob Dylan, Neil Young, Joni Mitchell, and Lightfoot himself, were surprise guests. The fact that the author is himself a musician - one whose band recorded a somewhat controversial version of Wreck of the Edmund Fitzgerald - creates an opportunity for a different perspective and perhaps unique insights. A special treat is that the hardcover book contains photographs by Arthur Usherson, taken at Mariposa 1972; there are photos of Lightfoot and of Bob Dylan, and other legendary musicians including Neil Young, Joni Mitchell, Bonnie Raitt and more - a real treasure trove. The cover photo, shown here, is a famous one of Lightfoot and Dylan at the 1972 Mariposa. (Note: The information on photos applies to the hardcover version of the book; the paperback and Kindle versions have a different cover photo, not by Usherson, and I don't think the same inside photos are included). This is a most unusual book; it is the story of the 1972 Mariposa Festival; it is a review of news events during one week in July, 1972 (culminating in the festival), and it is a biography of Gordon Lightfoot done without any contact with him at all - unusual with a living subject. However improbable it may seem that this could be a recipe for success, somehow Bidini pulls it off. To make it work, his Lightfoot "bio" is in the form of "letters" that he, Bidini, might have sent to Lightfoot. Bidini is a very entertaining writer, at once thoughtful, perceptive and engaging. While the events (historical and biographical) are taken from reputable sources, many lack precision and Bidini tackles the missing pieces by embroidering the facts with imagined details, weaving a probable story and yet letting the reader know which details are facts and which are the product of his own fertile imagination. When he tells the story of Mariposa 1972, and of Lightfoot, it is with the eyes and ears of a musician. He includes details that another writer might not notice or choose to include; things that only a musician or someone who spends a lot of time with musicians would appreciate. This adds to the authenticity of the book, and is an element that made it especially enjoyable for me. Early in the book, Bidini confesses that he has had no contact with Lightfoot, due - he surmises - to his own actions and statements about Lightfoot back when he was with the Rheostatics. He confesses that he made accusations, fueled by alcohol, presumably saying that he should now be forgiven for those foolish statements many years ago. And perhaps he should be. Some Lightfoot fans won't like this book because it pokes and prods, and doesn't make Lightfoot out to be a saint. But he isn't. He's a man; one who writes, plays and performs music better than the rest of us, but - like the rest of us - he isn't perfect, and he did some things during his lifetime that he would do differently today. But that is true of everyone. I think it's a good book, and hope that people won't judge it based on just the excerpt on the publishers' site. Make no mistake about it (pun intended), Dave Bidini has great love and respect for Lightfoot. He wasn't able to make contact with him, so - with his publisher's blessing - he wrote the book without talking to the "lead character", and wove that into the fabric of the book. If you are looking for a full biography of Lightfoot, this isn't it. There is "fiction", or perhaps I should say, "conjecture" in the letters to Lightfoot, but Bidini always lets you know when he is weaving tales. For biographical information, he uses material published previously, and some of it is about Lightfoot's personal life - always a tricky subject. He also interviewed additional people for the book; people who know Lightfoot fairly well, or crossed paths with him in the music business. For fans like us, who have read the other accounts and understand the sources quoted (like ex-wives and ex-girlfriends), it's easy to put those accounts into perspective. Frankly, I laughed out loud at many of the stories, and marveled at the artistry Bidini exhibited in weaving three stories into one good book. I read it in three days, and for me that's pretty amazing, as I normally have no time for reading. I couldn't put it down. I fear that Lightfoot won't like it, but frankly it doesn't say much about his personal life that wasn't said previously, and the love and admiration of Bidini — himself a gifted musician — shine through every page. I will conclude this review by commenting on one of Bidini's speculations, where I think he is totally off base. He speculates that Lightfoot did something as a publicity stunt. Publicity? Lightfoot? Sorry, but those words don't belong in the same sentence! Link to an interesting interview with Dave, the day of the book launch, October 20th: Interview with Dave Bidini.